This was a proud moment for Zak DeOssie - and, understandably, for his father, Steve. His son plays for the franchise with which he built his most cherished football memories, at the same position he played 21 years earlier on a championship team. When times were darker and trouble had found him, it was the family that ran the franchise that helped him get his life in order. Is it any wonder that Steve DeOssie wanted the Giants to win Super Bowl XLVI? He’s right. Had the Patriots not come out on the wrong side of a 21-17 score Sunday night, the video would already be an afterthought. 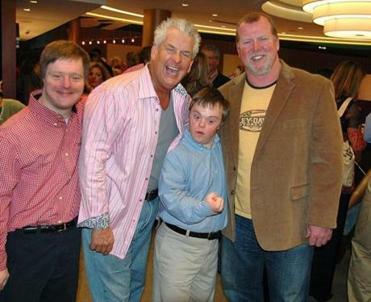 Steve DeOssie, right, with Michael Goodhue, comedian Lenny Clarke, and Peter Johnson at a 2008 charity event. And remember, DeOssie has never denied his Giants allegiance. His son, Zak, is the Giants’ fifth-year long snapper, a position Steve played for the Giants from 1989-93. When the Patriots and Giants met in Super Bowl XLII, Zak’s rookie year, his father was open about pulling for New York. But the problem for DeOssie, the reason he will be viewed by Patriots fans with an arched eyebrow for the time being, is that he was . . . well, a bit over the top in the video. “You know what, even if my son wasn’t playing on the Giants, I would pick the Giants, because they’re the better team, they deserve the game,’’ DeOssie tells the crowd. The approving roar arrives on cue. Damning? Hardly. Damaging to how he’s perceived in New England and to his credibility as an analyst? Maybe, though it shouldn’t be. DeOssie said yesterday he doesn’t regret his participation in the rally, but wishes that he’d chosen a few words differently. “The thing that’s lost in translation is that I talked about the great players that the Patriots have,’’ DeOssie said. “The mistake I made was that I didn’t explain why I struggle between New York and New England. It should not be overlooked that DeOssie’s loyalty is born of a time when he had struggles of a more serious nature. “When I got arrested with pot paraphernalia [while playing for the Giants], they could have easily dismissed me and wrote me off,’’ DeOssie said. “But the Mara family, the leadership of the Giants, asked me one simple question: if I wanted help. DeOssie appears on WEEI, Channel 4, and Comcast SportsNet New England. What follows are statements from each outlet. DeOssie will take a pounding on the “Whiner Line’’ for a while, but a few jabs from some radio wise guys is the most punishment he deserves. His appearance at the Giants pep rally should not cost him any of his jobs talking about the Patriots. DeOssie has proven in this market for more than 15 years that when he is not obligated to play an ex-jock caricature on the radio, he is more than capable of providing honest and insightful analysis of the Patriots, no matter whether his football heart is here or elsewhere. Because of a reporting error, this story mistakenly referred to Zak DeOssie as a fourth-year long snapper in an earlier version. This was his fifth season.